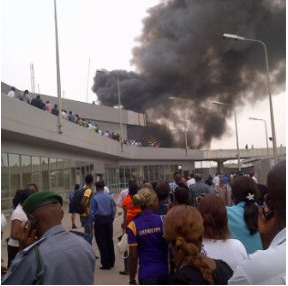 There was a fire outbreak at the Murtala Muhammed International Airport (MMIA), Lagos this afternoon. The fire engulfed the second floor of the airport, Daily Post reports. However, it was reportedly doused shortly after it started, preventing any serious damage to the building. Sources revealed that the fire which started at the second floor of the terminal in the commercial department of the Federal Airports Authority of Nigeria (FAAN), occurred because of a power surge.